We can make antennas based on your drawing, design, specifications. Diameters: 0.25", 0.37", 0.5". Length: 2", 3", 4" 7.5"
Other sizes and length are also available on request. We can cut any of the above rods to any required length. We can also machine rods down to any required diameter. The standard rods are available in NiZn material with a permeability of 125 or MnZn materials with a permeability of 800. Other permeabilities are also available. Please call us for more details. CWS also sells raw rods without any windings. To purchase rods, please call us directly, or purchase through the internet by visiting www.cwsbytemark.com. For technical details, please visit www.bytemark.com. The 125 materials rods (Material 61) are widely used for commercial AM ( 550 Khz to 1600 Khz) radio antenna and by amateur radio operators ( 3 Mhz to 30 Mhz). The 800 materials (Material 33) is more suitable for lower freqeuncy operations ( 100 Khz to 1 Mhz). Rods are also widely used in choke application. 2) As chokes in speaker cross over networks. The 125 permeability ( #61) rods are most suitable for filtering emi noise in the 7.5 Mhz to 30 Mhz range ( 10 to 40 meters band). Due to the open magnetic structure of the rods, significant current can be tolerated before the rods saturates. 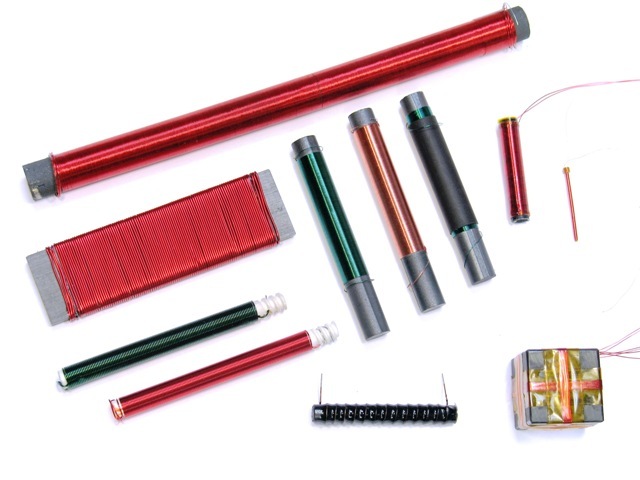 As antennas, the 800 permeability rods are suitable in 100 to 1000 Khz ( 1 Mhz) range. The 125 permeability rods are suitable in 550 Khz to 1600 Khz ( 1.6 Mhz). The 40 permeability rods are suitable in 30 Mhz range. The 20 permeability rods are suitable in 150 Mhz range. As the core's permeability reduces, the suitable operating frequency increases. 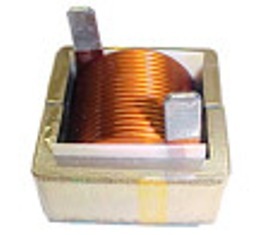 Coils wound on phenolic which is essentially an air coil will provide the highest operating frequency. In an antenna application, the Q is an important factor to achieve a narrow band. To achieve high Q, the interwinding capacitance at high frequencies must be minimized. Experimentations show that the best Q is obtained when the coils are wound with one wire diameter spacing between the turns, rather than being closely wound and when the coil is lumped at the center of the rod. Experiments also show that spacing the coils over the entire length of the rod ( with the same number of turns) will also produce a good Q. In this case, when the entire rod lengths are used, the spacing will be greater than one wire diameter apart, and so the inter-winding capactance is the lowest. Use of Litz wire will produce higher Q over the solid wire with the same gauge.